NAMM 2015: Plenty of musicians would already call guitarist Steve Lukather an "icon," but now he's the first artist to release a signature pedal in ToneConcept's upcoming "Icon" series of effects, the result of his collaboration with the musical instrument design company. 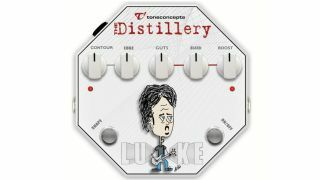 From press release: Steve Lukather was an early tester of ToneConcepts' award-winning pedal, "The Distillery,"which quickly became an essential component of his sound and earned a permanent place on his pedalboard. "The sound wizards at ToneConcepts blew me away with "The Distillery," so I went straight to them to develop an enhanced version for my first-ever custom pedal," says Lukather. "The Luke" is an innovative and musical tone-shaping preamp boost with unparalleled power, transparency and tonal flexibility that takes any guitar and amp combination to the next level of musical bliss. "'The Luke' is my secret weapon that helps me sound great onstage and in the studio. And it will do the same for you," says Lukather. Extensively tested by Lukather, "The Luke" features hand-selected components for an open and refined sound. The new pedal also features an improved control layout with custom pot tapers resulting in improved control, fine tuning and usability whether you're playing in a garage or a stadium. "The Luke" is housed in an octagonal pedalboard-friendly roadworthy case that features a unique cartoon by "Astro" (Lukather's guitar tech and good friend). From subtle enhancements to drastic tonal changes, "The Luke" unleashes your guitar's range of possibilities. "TheLuke" will be available to dealers worldwide in March2015. In addition to the standard edition of the "The Luke," a special limited production "Luke Launch Edition," of just 100 units is now available for pre-order directly from Tone Concepts.